A DIFFERENT KIND OF EXPERIENCE - This week at the Royale I turned my back from the close-knit community of the last few weeks’ RnR Rumble shows to a gig of a pretty major band: The Kills. One of the really great things about this show was that, despite some clearly engineered elements, The Kills still managed to be just as personally affecting as any of those excellent local performers. They were just as determined to get to me as those other bands, even though they have clearly already ‘made it’ to a point of success that sometimes prompts less dedicated groups to perform carelessly, and without real commitment. That isn’t to say that the evening wasn’t also a telling example of the way big bands (or big bands’ handlers) orchestrate our musical experiences. The choices of support acts, and sometime even the tracks played between sets, are not carelessly thrown together. The jump from local showcase to national tour brought these kinds of maneuvers into sharp relief. 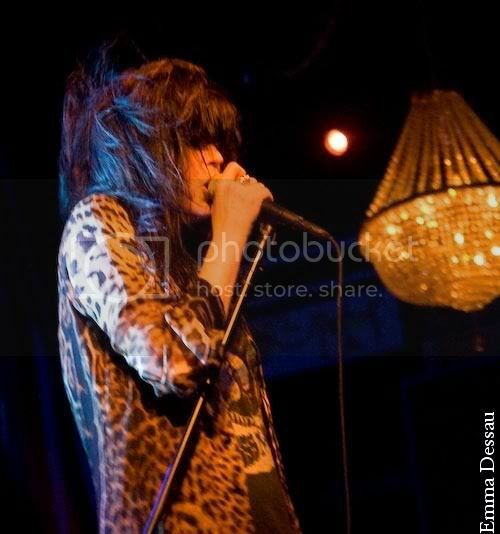 The Kills were supported by two other bands for example, and each seemed to suggest two different sorts of headline act on the way. The Entrance Band won over those who arrived early with a clever balance between skill and energy. Like the mix of rock tracks that played between sets (like “Bleach”-era Nirvana), they set us all up to see The Kills as very much the dirty sounding rock project that they look like, from Jamie Hince’s outfits to Alison Mosshart’s wild hairstyle. But then we were guided in a quite different direction by NYC’s Cold Cave, who played without distorted guitars and bass, but with disco beats and heavy synths. Were we to conclude that The Kills, a little more polished, structured and layered in their new album Blood Pressures, are like the Yeah Yeah Yeahs before them turning towards music you might feel you should dance to, instead of fist-pump to? Given some of the questionable reviews Blood Pressures has had elsewhere, the similarity to YYYs experience, with their last effort, was interesting and perhaps plausible. So are this version of The Kills a band you can really dance to, or still a menacing rock act? Before they even came on stage it seemed they were trying to position themselves at the intersection of these different styles. Once I heard them though, blasting through both old and mew material in roughly equal measure, it was clear the rock/ dance debate was all a more or less carefully engineered misdirection – these were the wrong labels to tie them to. It’s true that The Kills are a band that play songs you want to move to. They also write music dressed in angry beats, grinding guitars, and Mosshart’s scrawling voice. But surprisingly the songs feel ultimately like blues music, made to sounds so fresh and new that these roots are sometimes hard to spot. 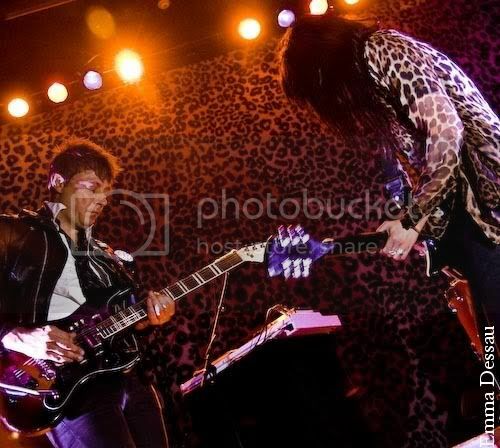 As our photographer Emma wrote in her show advance, The Kills do indeed "exude coolness." It’s this trick they can pull off – of making old style tunes sound like newly formed, genre-bending music – that means they are really worth seeing.